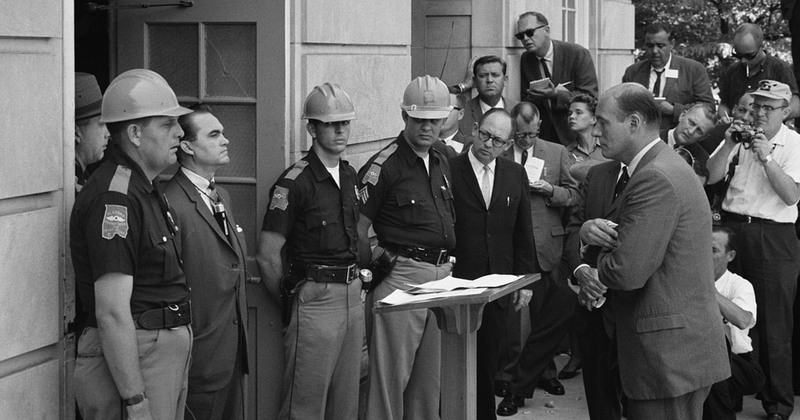 Attempting to block integration at the University of Alabama, Governor George Wallace stands defiantly at the door. $475 million (73 percent) went to one of the 12 percent of schools where white students make up more than a quarter of the student body. 75 percent of the students in overcrowded schools in 2011-2012 were Latino, but they make up only half of the students in schools that got new construction. 18 percent of the students in overcrowded schools were white, but they make up 30 percent of students in schools that got help with overcrowding. $224 million (more than one-third) of the recent and proposed construction projects are intended to relieve overcrowding at schools sharing a border with a school that has space for additional students. $193 million* is for magnet and selective high schools, which disproportionately serve white, middle-class families–a trend that has become more pronounced during Emanuel’s tenure and since CPS was released from a court-order to desegregate its schools. *These categories overlap, so the numbers do not add up to $650 million. CPS has spent millions of dollars to build new schools or annexes while perfectly good schools sat underutilized just a few blocks away. The interest on just the school construction projects already done could be as much as $750 million, according to estimates in the district’s 2013 master facilities plan. Racism can never be underestimated, but it is cynical and disingenuous for CPS to determine, without even trying, that middle class parents would be against sending their students to a school with impoverished Black students. School Integration works! It has a positive impact on all students, both academically and socially. In fact, parents at Lincoln lobbied, to no avail, for a merger with under-utilized Manierre, as an alternative to constructing a $19 million dollar annex. CPS proceeded with the annex anyway. Also, parents at Ogden (14% Black, 21% low income) and Jenner (97% Black, 99% low income) proposed a merger to relieve overcrowding at Ogden and make use of Jenner’s underutilized building. The Jenner community rightfully wanted assurances that neighborhood students would still be able to attend the school. (When Ogden moved into the old Carpenter School in 2009, Carpenter was phased out and neighborhood students had to attend Otis School, a half-mile away.) Even without these assurances, CPS refused to move forward with the merger, apparently to appease some loudly vocal racist Ogden parents. CPS ignored the fact that the merger was supported by the majority of Ogden parents. School Integration works! It has a positive impact on all students, both academically and socially. Yet, CPS is determined to continue its segregationist policies. CPS has turned its back on the thousands of students it has relegated to schools that are triply segregated: by race, income, and academic engagement. These schools are regularly under attack — they are threatened with closure (and are the vast majority of those already closed), denied needed resources, and subjected to a revolving door of failed programs. Where feasible, DSP shall propose establishing or revising attendance boundaries to maintain or promote stably desegregated enrollments in each of the affected schools and to avoid the creation of one-race schools. In reality, CPS has fought integration at every step of the way. In 1980, (26 years after school segregation was to have ended) a federal court ordered desegregation in Chicago. By 2009, the order ended, supposedly because too few white students attended CPS schools to make desegregation practical. Now it is 2016. CPS has an opportunity not only to do something that will improve students’ education, not only to show leadership and to put a crack in the legacy of segregation, but also to save money! Yet, the district refuses to do so. Mayor Emanuel’s vision of 21st century schooling looks an awful lot like Sixties-style racism. disinvestment, racism, segregation, selective enrollment. Bookmark.